You don’t already have a set of these bangles? Oh my gosh, gag me with a spoon, Veronica, that is bogus! Before you sneak out to see Jared -- skater, rocker, boy toy -- make sure you've got a great wrist candy. These 80s Neon Bracelets have all the color and dangle you need to make your look pop. Seriously, you're going to look totally bad to the bone! 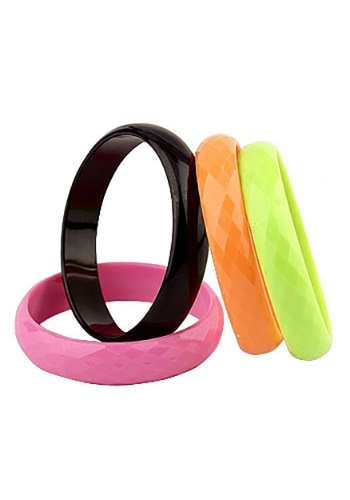 Black, pink, orange, and green, these bangles are going to go with any outfit of your choice. These 80s Neon Bracelets pair perfectly with almost any 80s costume. However, if you really want to bring some vintage style into your everyday wardrobe, slip on a pair of these subtle bracelets. Grab a pair of leg warmers, fishnets, and a leotard, and you will be ready to get physically fit!